Be the first to share your favorite memory, photo or story of Karl. This memorial page is dedicated for family, friends and future generations to celebrate the life of their loved one. 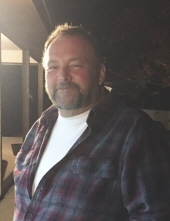 Karl H. Jerge age 58 of Hartford, Wisconsin passed away October 20, 2018. Karl was born on November 6, 1959 to Richard and Irma Jerge. Karl proudly served in the United States Marine Corp for 4 years. Karl was a devoted husband, father, and grandfather. He was a kind, caring person who left an impression on everyone he met. Karl is survived by his beloved wife, Vicki; loving children, Erin (Michael) Knueppel, Josh (Kristy Buck), Kristina (Brian) Hanson, Kody Jerge (Desiree Shea); grandchildren, Brooklyn, Gavin, Khloe and Ansley; and his siblings, Kittie Jerge and Kirby (Shari) Jerge. He is further survived by many loved nieces, nephews, other relatives and friends. He is preceded in death by his father, Richard. Memorial Services for Karl will be held Tuesday, October 30, 2018 at 4:00p.m. at the Shimon Funeral Home (824 Union Street Hartford, WI 53027). Family will greet relatives and friends at the funeral home on Tuesday from 2:00-4:00p.m. To send flowers or a remembrance gift to the family of Karl H. Jerge, please visit our Tribute Store. "Email Address" would like to share the life celebration of Karl H. Jerge. Click on the "link" to go to share a favorite memory or leave a condolence message for the family.